Posted on May 31, 2016	by True story. Really. I’m fascinated by learning, and the ways we learn. It has always seemed to me that there are three main ways to learn – by example, by experience, and by explanation. Example comes first – when we are babies, all we have are the examples of our parents and the people around us, showing us how to talk, walk, etc. Once we get a little older, experience and explanation enter the picture, though anyone who’s spent time with a toddler – or a teen, or an adult, for that matter – knows that sometimes explanation will only take you so far. And learning is a fascinating process, because the things we learn from the lessons we are given do not always play out in the ways we might expect. Think about it: If someone we like and trust tells us something that is actually wrong, we are still likely to believe it. Possibly even more likely than when someone we dislike or mistrust tries to teach us something that’s factual. Our feelings about the person can shape how we interpret information much more than how true the information is. Now, if adulthood has taught me anything, it is that you cannot always believe the things people say, however you might feel about either the people or the things. And you should be particularly careful about believing things folks tell you about yourself. I’ve been on the receiving end of a lot of incorrect pronouncements, and I’m not even talking about middle school bullies or anything like that. Many were well intentioned, delivered by people I loved and trusted, and quite often they had more to do with the person talking than they had to do with me. But boy could they be insidious. From ‘you’re tall’1 to ‘you always know what to say’2 and ‘you’re the kind of person who can get away with eating anything’3 all the way to ‘you’re so confident!’ 4 I have been told an awful lot of things about myself that were just plain wrong. When I was very young, I actually believed a lot of those things, often to my detriment. When I was a bit older, and a bit less credulous, it was hard to know what to believe. Now, a whole lot older, I see these things for what they are – though many were well intentioned, they usually had more to do with the person talking than they had to do with me. But they can also be insidious. And I doubt I’ve been alone in all of this confusion. So it turns out that learning yourself is a critical step toward adulthood. It came later for me than I would have liked, making my learning curve very steep. To make up for lost time, my activity level now is pretty high. There is so much I want to get to. I want write, to learn whether I can write, and to get better at it. I want to learn Spanish – really learn it. I am determined to work on the skills that really matter to me, and leave behind the stuff that isn’t satisfying. It’s a process that feeds on itself, I’m finding – the more I learn what matters to me, the better equipped I am to find the right direction to move in, to learn who I really am, and do more of what’s important. Also probably I’ll be failing, really stinking things up, from time to time. Should be quite a journey. 1 – I’m not, but the person who told me that was really short. 2 – I don’t. I really don’t. 3 – And that was a nurse! Posted on May 21, 2016	by True story. Really. I’ve been thinking a lot about storytelling and poetry lately, and found this poem as I looked through a book called Potato Chips and a slice of moon. This was probably the first poetry book I ever bought, undoubtedly by way of a Scholastic book order form, when I was in grade school. I don’t have many mementos from my childhood, but this book is one I hang on to. I remember reading it a lot back then, and I still have some of the poems memorized. I loved this one for it’s almost tactile quality – I could picture the trains dripping off the trees, almost feel their stickiness. Mark Van Doren (1894-1972) was an American poet and academic. My favorite title from among his poems is Apple Hell. Aside from the great title, how can you not love a poem that includes the line “Time is Tarnish”? You can’t. You just can’t. That’s how. Posted on May 18, 2016	by True story. Really. If you’ve poked around here at all, you might have noticed that there’s not much on my About page. In part, this is because it’s hard to know what to say about me that hasn’t already been said. Works in an office. Right handed. Not very tall. Can’t dance worth a damn. And after all that, really, what’s left? Well, I guess there’s the writing thing. That’s a semi-recent development, in the sense that it only dates back about five years, and during most of those five years, it’s been more of a nebulous concept than an actual activity. There’s been some on, but until last year, it’s mostly been off. Then late last summer I decided (for maybe the 12th time) to start taking myself seriously as a writer. Even if nobody else ever does1. I started writing every day, giving attention to a couple of stories that have been rattling around in my brain, and looking for opportunities2 to do more structured, directed work. The very first thing I did was to return to 750Words, a site that I have been using (again, off and on) for several years. It’s not perfect, but can be really helpful in terms of starting and keeping up a daily writing practice. Right now I am thisclose to 300 days of writing in a row there, and that alone feels really good. In October, I participated in the Writers Digest Platform Challenge. This challenge offered numerous valuable lessons in considering all the possibilities and expanding my comfort zone. The Platform Challenge also introduced me to a great group of writers from all over the US and the world, a group that has become an important source of inspiration and humor in my writing life. Taking the sage advice of numerous writers who tell you to always have two projects going, I also (in a leisurely way) did the Writers Digest NovPAD (poetry) challenge during November. This was a lifesaver on days when I couldn’t face my story, and it turned out that I actually enjoyed writing a lot of it. My results were mixed – some of the poems were, surprisingly, not too bad. (A few of them are posted at this site, in fact.) Some were not so good. Some turned out to be like little jokes I was telling myself. However they turned out, the challenge helped keep me writing. At the end of November, I printed out and packed up everything I had done, and put it away for a while. Then I began expanding a story I started in 2011, about a woman who may be leaving an unhappy marriage at a time when doing so is pretty complicated. (A piece of this can be found here.) And I joined up with a great group of local writers whose feedback and encouragement have meant the world to me. This year I re-launched my blog (thank you for visiting!) and got back on Twitter. Wrote some short pieces just for the fun of it, and developed the habit of actually writing down new ideas. (It never ceases to amaze me how quickly a good idea can enter and leave your head.) And in April I did Camp NaNo and the Blogging from A to Z challenge. This year I started calling myself a writer, and for the first time in a long time I started feeling like I might actually finish a project. Who knows? I might even get around to writing that About page. Let me be clear here – I am incredibly lucky, because somebody else actually does. A few people, including my husband, my child, my writing fairy godmother, and a few friends whose enthusiasm has actually been a really pleasant surprise. There are, of course, a few friends whose lack of enthusiasm has been a bit disappointing, but it’s certainly possible that I have let them down in small or subtle ways, so I’m cool. The good is so good, and sometimes so unexpected, that it definitely outweighs the bad. Among Gretchen Rubin’s four tendencies, I am an obliger, which means that someone else’s project, deadline, expectations will always carry more weight with me than my own. This is probably why I like challenges – they allow me to externalize my projects and priorities, and that’s when things start getting done. Posted on May 14, 2016	by True story. Really. When I was in graduate school, I took a course in urban geography, and one of the texts that we read was a book called City of Plagues: Disease, Poverty, and Deviance in San Francisco by Susan Craddock. In the opening paragraphs of the first chapter of the book, Craddock describes a visit to a San Francisco homeless shelter in 1991. She found ‘a number of small rooms … located off a central hallway, each room containing six built-in bunk beds, three on each side with perhaps three feet separating each bed. None of the rooms has a window.’ She also observes that the few windows in the hallway ‘look as if they have never been opened.’ There’s more, but you probably get the picture. At a time when fully one third of the city’s homeless population was testing positive for tuberculosis, it would be hard to imagine a worse design for limiting the spread of the disease. Or, as she put it, ‘it would seem that the homeless shelter was designed specifically with the transmission of tuberculosis in mind,’ but not in exactly the way we might expect. Even back in 1991, tuberculosis (or ‘consumption’ if you’re from the early part of the 1900s) was a disease with a long history, about which the medical and public health establishments had been fairly knowledgeable for a pretty long time. If you imagine an early 20th century tuberculosis sanitarium (like the one pictured above) you are probably picturing big, open rooms and big, open porches scattered with rocking chairs and frail women wrapped in blankets. You are probably not imagining a ‘beehive’ of cramped, windowless rooms with folks sleeping in bunk-bed close quarters. I remember vividly when I first read that chapter in that book, thinking how bizarre it was that people could so easily dismiss or ignore information that was readily available. I’m sure I had heard of cognitive dissonance and cognitive bias before, but I found this example so concrete and so jarring that it really stuck with me. Anchoring Bias – What was the first thing you learned about, say, how to cook? Or how to buy a car? Anchoring is when we rely too heavily (or ‘anchor’) on one thing (usually the first thing we learned) when making decisions. Was it Dear Abby or Miss Manners that said that for most folks, the ‘right’ way to wash dishes or fold towels is usually the way your parents taught you. The way your partner’s parents did it? That way is the wrong way. The first place I learned about the Blogging from A to Z Challenge was at the WriteOnSisters blog, and initially I was confused. In retrospect, I’m not sure exactly why I was confused, but it didn’t take me too long to figure it out, and once I did, I couldn’t resist. Having just recently (re-)launched my blog, it seemed like an excellent way to jump start my writing. I’d done National Novel Writing Month recently enough that having a month-long task felt really doable, and (bonus!) unlike NaNoWriMo, the A to Z challenge didn’t require that all the work be done during the challenge month itself. So what did I learn? A ton, both about the mechanics of blogging and about myself as a writer and blogger. The other thing I did was to set up a document that had the reference and attribution links that I re-used. Otherwise I would be hunting them down daily, and that’s just annoying. I also learned to be careful about keeping source information for things that I wanted to save for future use. There’s nothing worse than having a picture or snippet that you love but you can’t remember (or find) the source. On a more personal level, I learned just as much. Perhaps most importantly, I was reminded about how important it is to be a realistic judge of how long things are going to take. As I’ve mentioned elsewhere, in addition to the A to Z Challenge, I also signed up for Camp NaNoWriMo and had a fairly labor-intensive out of town work commitment for the last week of the month. Pre-scheduling posts eased this up a bit, but it was still probably too much. And however much I told myself that I didn’t have to finish both challenges, in my heart I knew I did have to. It was stressful, but in the end I was pleased with the work and the accomplishment. All that did leave very little time to explore other people’s blogs, though, and that’s a real regret for me. On the more positive side, I unearthed a love of poetry that came as a real surprise. Although I definitely think of myself as a prose writer, the blogging format – for me, anyway – seems to lend itself more to shorter forms, including poetry. This was a very pleasant discovery. Another was how much I have enjoyed my forays into translation. I’ve been working for several years to improve my Spanish, and it turns out that translating Spanish poetry is a really challenging and enjoyable way to enhance that work. 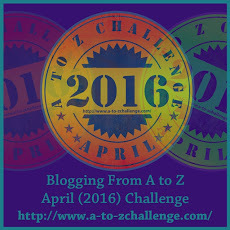 Will I attempt the A to Z challenge again next year? Probably. For one thing, I won’t have the weeklong work event at the end of the month, and hopefully I will be more efficient in both my blogging and my writing. Either way, though, I should probably give serious thought to choosing either the A to Z Challenge or Camp NaNo, rather than both.